I got this dress a while back when it went on major sale at Nordstrom. I actually ordered 3 of them to see which I liked best and finally settled on this navy blue color. It's a flattering cut and the ruching across the tummy helps disguise problem areas. There is a sleeveless version I am debating on for summer I like this one so much. Sizing runs small so I would recommend sizing up one size from your typical size. Because it is still pretty chilly here, I paired it with a pink cardigan and the Alison Semi-Precious Pendant necklace in Cobalt from Alison + Aubrey. 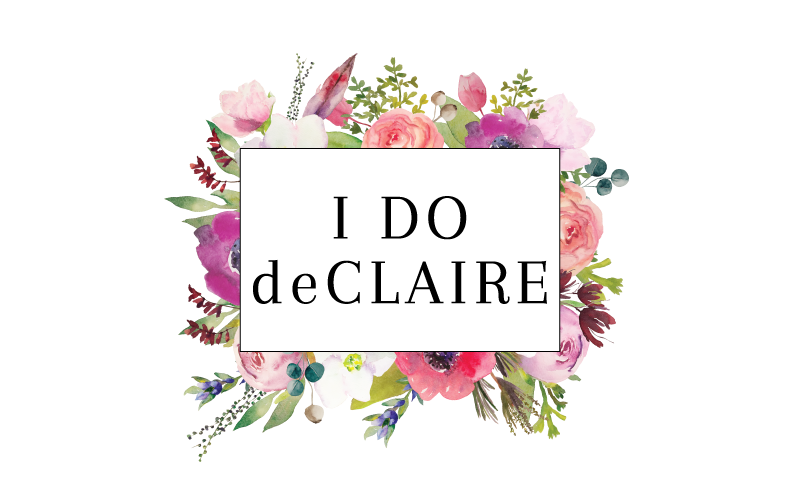 They just launched their jewelry collection and it's full of beautiful pieces that work across settings and ages. 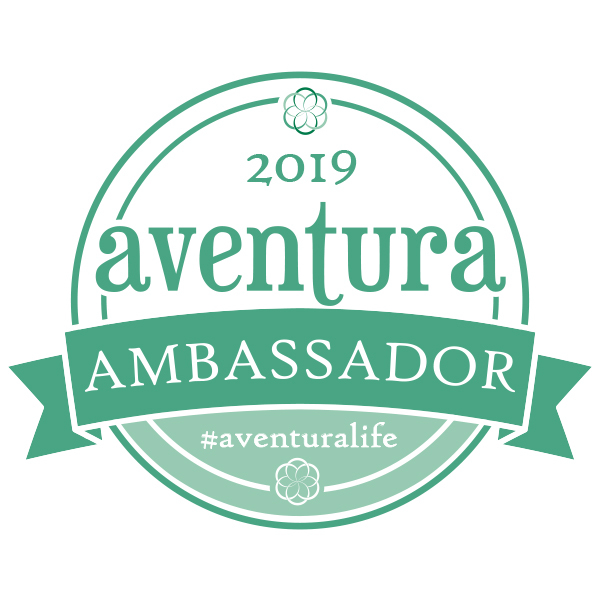 Their mission is to inspire mothers & daughters of all types across the world to celebrate their strong bond over the love of fashion and jewelry, and to empower all women to feel confident in their every-day style choices by providing unique quality accessories to compliment any outfit. And all of their pieces are affordable! 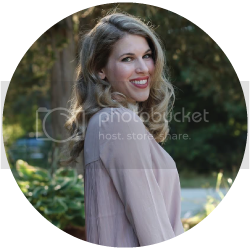 Alison + Aubrey was kind enough to sponsor a giveaway for an item of your choice from their collection! You can enter below. And use code LAURA15 through April 30 for 15% off your total order! Last week's most popular post was from Ruth at My Little Nest. Doesn't see look fabulous in her monotone grey work outfit?! I am loving the gorgeous blooming trees in the background, too! This dress is beautiful and I love the navy color. I like that you paired it with a pink cardigan for a nice color contrast! I have been eyeing this dress for awhile now too and saw it go on sale unfortunately it was only available in bigger sizes so I couldn't try it on. Love the pink and navy combination!! Great giveaway! Pretty Pretty Spring color combo!! Og how I love peep toe booties in the Spring!! You are CUTE as can be! I love that dress on you, I debated getting it and wish I had! I love the ruching and the color is so pretty on you. It will be great for all seasons, terrific dress! Love this ruched dress! So perfect to layer over too. Thanks for this awesome giveaway! This jewelry line looks amazing. Love the style of your dress :) Thanks for hosting. I've been eyeing this dress for some time. It is so pretty and I agree with the color you picked out as being perfect for spring! Laura, I love this dress and your entire outfit! And I love that you are hosting an Alison & Aubrey giveaway! 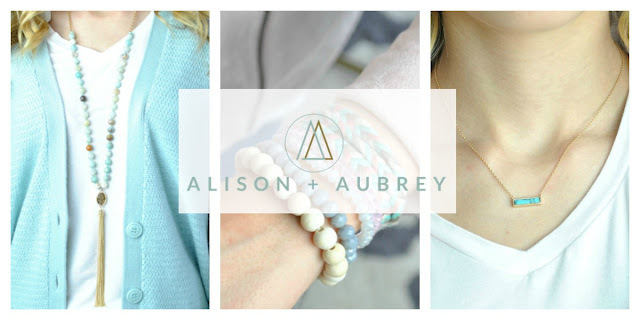 I am planning a wish list post for Alison & Aubrey very soon sharing some of my favorite pieces! I love this kind of dress, Laura!! I have one in pink and I think it's so versatile. I've worn sweatshirts over it and everything!! This navy dress is so very pretty and flattering! 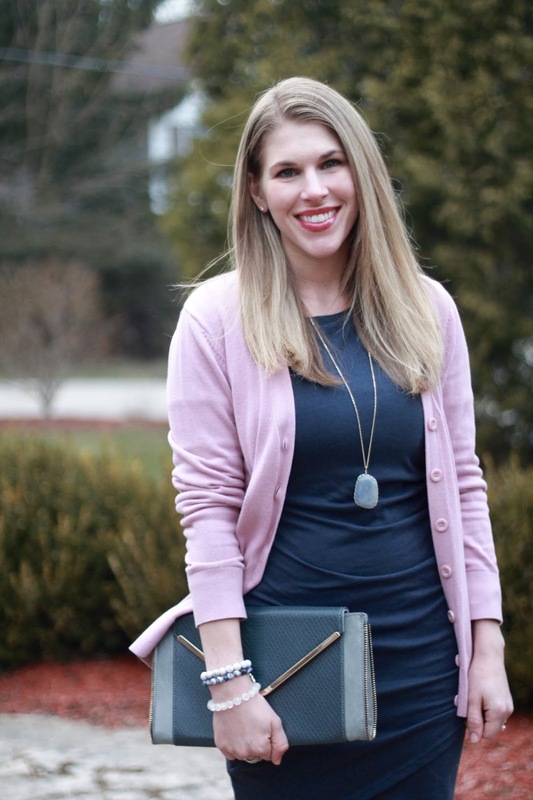 Your pink and navy combination is perfect for spring. Oh, you look so lovely in this dress! I love how you styled it with the booties and cardigan. That cardigan is so pretty too. Love the flattering silhouette of your dress! And I'm so into pink this season I am loving your pretty cardigan! Great look! Love the style of your dress on you Laura, and navy and pink are such a pretty combination. i also love your booties, great style! You are rocking this dress. Thanks for hosting this giveaway. I love this look, the dress is so flattering on you, and the pendant necklace is just gorgeous. Just love navy + pink together and this dress is a beauty! That stone pendant necklace is so pretty, I can't wait to enter the giveaway! Thank you!! Love that dress on you! So pretty & flattering! Such a great dress! I have the same one in the version that has sleeves and have considered getting this one. Looks so good on you. First off I was so excited to see that picture! It was one of my favorite shoots I did! I also love that dress and think you look amazing! Such a pretty color scheme Laura ! The cardigan! The dress! The necklace! The booties! I love it all—what a great look! I own that same sleeved dress in a beautiful heather coral or peach color. I want a sleeveless one in grey or some type of blue. You styled yours so well. The necklace and booties are gorgeous too! That seems like a dress that I would wear over and over again! And itblooks great with the blush cardigan, great color combination! That dress is so flattering and so versatile! 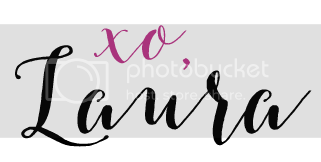 Thanks for hosting the link-up! This dress in one of my favorites, and I love it in the navy color! Such pretty jewelry too! Ohh that dress is perfect on you! I love it with the pretty pink cardigan and necklace. I always think that a form-fitting dress like that wouldn't be flattering on me but maybe with the ruching it would work--I love it! Ruched dresses are so flattering - and this one is gorgeous. Love the color. So pretty on you! This dress looks fabulous on you, Laura! So glad you decided to try this style and how lucky that you were able to get it on sale. I love this dress, it's so cute and I love those shoes too! Ruched part is so flattering! Fabulous dress! I love the navy blue and pink together. Gorgeous booties too! Cute contrast of color you have here with your dress and cardigan dear. So chic and smart!